Passion and the will to deliver top-notch translations were the impulses that guided the creation of Roboto. With each task treated individually, we always strive to do the best job possible. We conscientiously approach game localisations, film translations, as well as literary translations. We love to play with words, but also value their meaning and creative potential. WE SHARE A VISION, WHICH COULD ONLY BE REALIZED WITH OUR PRECIOUS TEAM. A team of people, who don’t consider work merely a profession, but a fulfilling adventure. 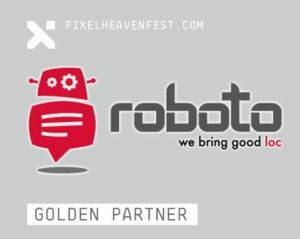 We are proud to announce that we have become a Golden Partner of Pixel Heaven 2018. The event will take place in early June in Warsaw. In just two weeks, the 58th Krakow Film Festival will begin. This is the second significant film event in our portfolio. We wish you lots of fun with the films we have translated! In May we’ll be in Kraków at Digital Dragons 2018 (21-22 May), The biggest game industry event in Central Europe. We hope to see you there, as it’s the perfect opportunity to get to know us better and talk about our offer! PSX EXTREME is the biggest and oldest console gaming monthly in Poland. Each year, their readers reward the best games on the market, including the best full localization of the year. Among the awarded titles there were as many as 7 games localized by us! The team responsible for business translation and interpretation at Roboto is a separate group of professionals. Roboto has been operating on the market since 2002, successfully carrying out complex projects in the multimedia industry (games, movies, books) as well as business translation projects. In the last decade, we have worked with more than 150 companies all over the world, half of which enjoy a continuous business relation with us. Should you wish to get more details, we kindly invite you to browse through references we received from our partners. Roboto has proven time and again its worth as a competent and reliable localisation partner. Its team shows both skills and know-how to create localised versions with tight deadlines and at competitive prices. I recommend them for Polish translation and recordings for any kind of games (AAA). They did a good job for HAWX 2 (cost and quality wise) and I would use them again without a doubt. They are, starting from HAWX2, the best Polish resource I’ve worked with. Working with Roboto in the audio localisation (…) was a real pleasure despite the high complexity and tight deadlines of the project. We could always count on excellent communication and immediate feedback from their side (…). We would highly recommend using Roboto. Roboto offers incomparable service to our company, covering such tasks as translation, voice-over recording and LQA testing. The quality of service provided by Roboto is trully impressive. The team of translators, proofreaders and testers is always ready to come up with adequate solutions for unusual and demanding terms.